Above: The Kennedy Center African Lounge Doors and Transom after the treatment process. 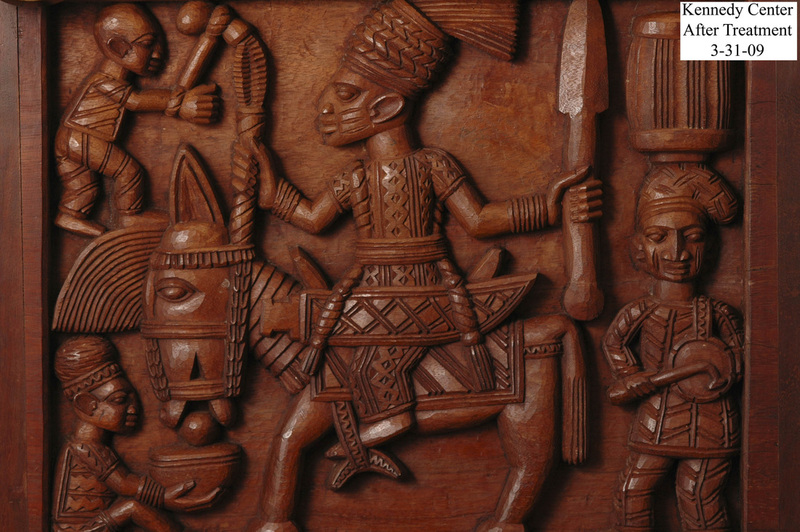 In 1973, the Nigerian carver Lamidi Olonade Fakeye was commissioned by the Nations of Africa to carve a pair of doors and transom that would then be given as a gift to John F. Kennedy Center for the Performing Arts to be installed into the African Lounge. 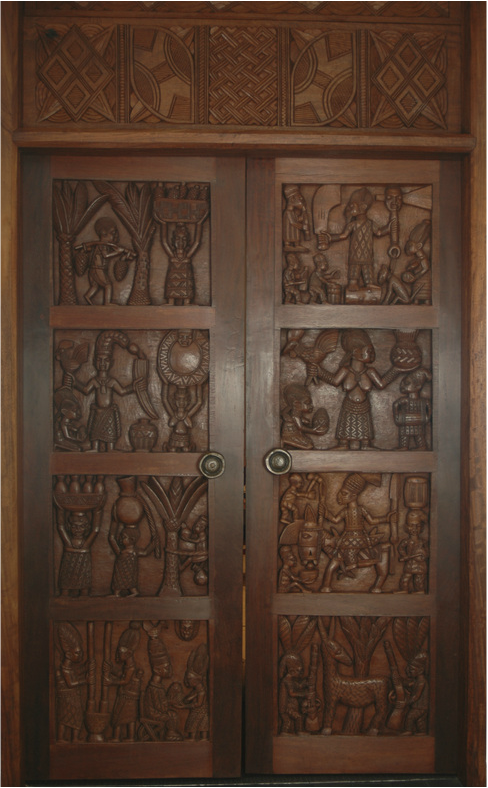 The doors were made from the wood of a single, 700 year old tree and depict Yoruban village scenes. In 2008-2009, Schuettinger Conservation worked onsite to treat these important artifacts, infilling compression set shrinkage cracks, remediating older repairs, and removing the later coatings that had been applied over the original coating layers. 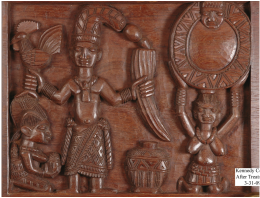 Our task was to re-establish the appearance of the original finish, evident in the carved transom panels above the doors which had been treated with fewer finishing products since the doors' installation. 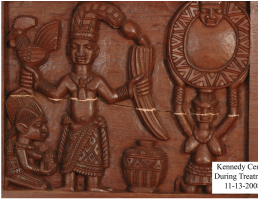 These images in this section illustrate some of the aspects of our conservation treatment. Above: Bruce Schuettinger removes various contaminant layers utilizing both scalpels and a HEPA vaccuum filtered and a natural fiber brush. Right is an image of the room during the treatment process. Panel showing cracks running across before treatment started. Panel showing infilling of the crack during the treatment process. Panel after the treatment process. 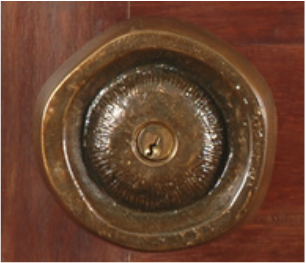 Right: The custom designed cast bronze doorknobs for the doors are original and retain much of their original patinated presentation surface, but there was both wear to that patinated surface and accumulation of dirt and grime. 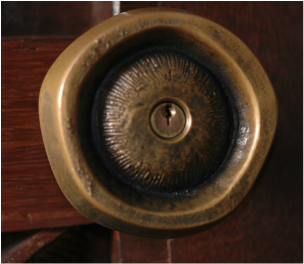 The door knobs were treated to remove the contaminant layers and to incoat the knobs with coatings to replicate the original patinated surface as well as to apply a uniform clear coating to protect them in the future. Left: Depicts some of the documentation that is part of our treatment indicating the areas where various markings were detected. These marking were part of the original carvers layout. Below: Panel 3 of the door after the treatment process.